Once again the Blue Orange Theatre presents a Half Term Youth Theatre Workshop for all those budding young actors out there! Are you aged between 7 and 13 and looking for something fun to do during the half-term break? 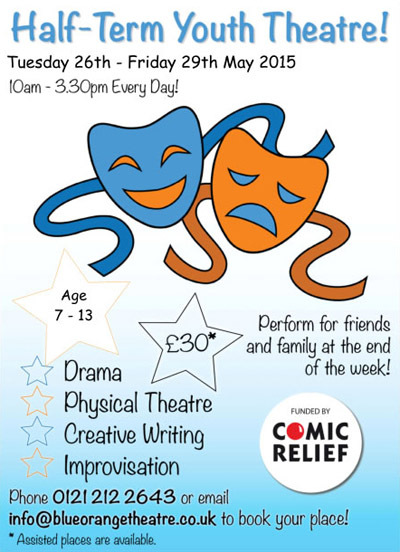 Well look no further, the Blue Orange Theatre will be providing 4 days of drama workshops – learning such skills as characterisation, scriptwriting, improvisation, devising, mask, mime, movement and physical theatre skills all at the price of £30 for the week between 10am and 3.30pm. Throughout the week, you will be given the opportunity to create an original piece of drama with the help of our professional drama workshop facilitators. The final piece will be performed on the last day to an invited audience of close family and friends.